Los Gatos, California, May 7, 2011. 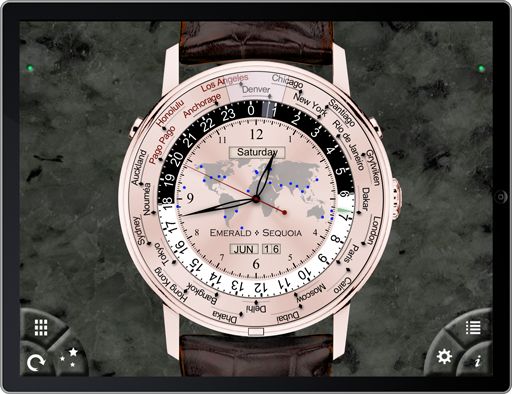 Emerald Sequoia LLC today released Emerald Chronometer HD, an iPad version of its highly rated Emerald Chronometer iPhone app, in conjunction with a 60% price reduction in the iPhone app, which is now about USD$2. Both apps model running 15 mechanical watches, with very fine precision and an emphasis on astronomical complications. Emerald Chronometer was Apple app of the week in July 2008, an Apple "Staff Favorite" in December 2008, and was rated the BEST clock app at appreview.com, and has been improved continually since it was first introduced. Both apps are available now at the app store (Emerald Chronometer HD, Emerald Chronometer). Emerald Chronometer HD is functionally identical to Emerald Chronometer, except that it takes full advantage of the increased resolution of the iPad, and runs in landscape mode there. You can find high-resolution screen captures of Emerald Chronometer HD here, and a full description of all of the functionality included in both apps on Emerald Chronometer's website here. Both apps include a full copy of this website as in-app Help, which has been described by a reviewer as the best Help system available for any app. Emerald Sequoia LLC is a two-person company whose combined experience in software development is over 55 years, and which has been involved with iPhone app development since the first beta development kits were available from Apple in the spring of 2008.